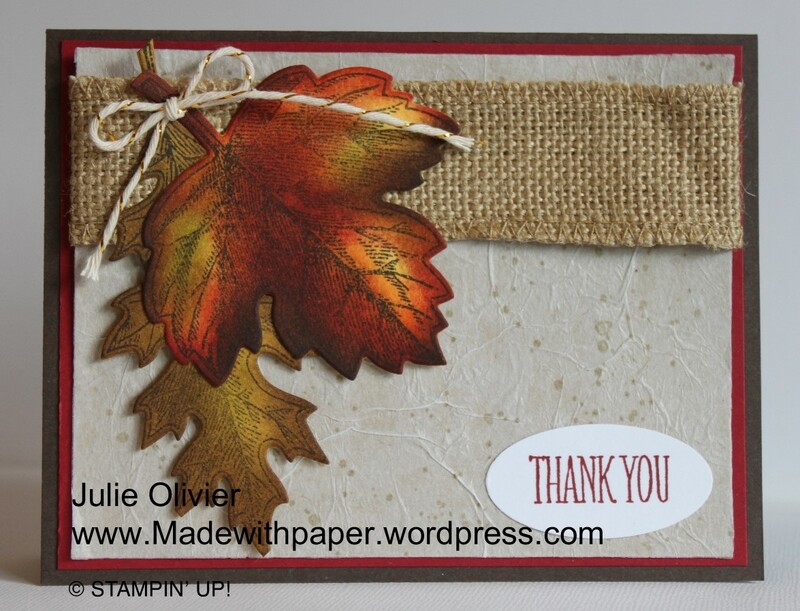 To keep with the “Thanksgiving theme”, I would like to share with you another card that I made using the Vintage Leaves stamp set. I also used Block “D” to make the square in the background. I first inked my Block with Crushed Curry ink and then ink only the outer edges with Pumpkin Pie ink, using the “Rock and Roll” technique! I stamped my Maple leaf on top with Memento Black ink. 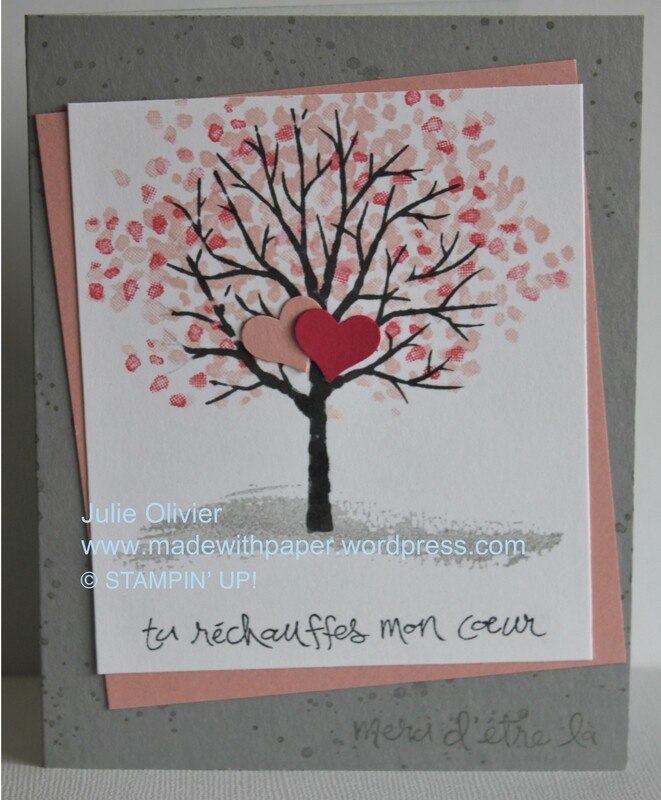 To complete my background, I stamped some ink splatters using the “Gorgeous Grunge” stamp with Sahara Sand ink. Ink: Sahara Sand, Memento Black ink, Crushed Curry, Pumpkin Pie. I’ve been away from my Blog for a bit since I started a new full time job. I’m really happy about this new turn in my life, but I had to re-adjust to this new life and therefore I’ve neglected my blog in the process!!! Today, as we celebrate Thanksgiving, I’m very grateful for my family, who is very supportive and who I deeply love. I’m grateful for my customers and followers for reading my blog post and leaving me comments! 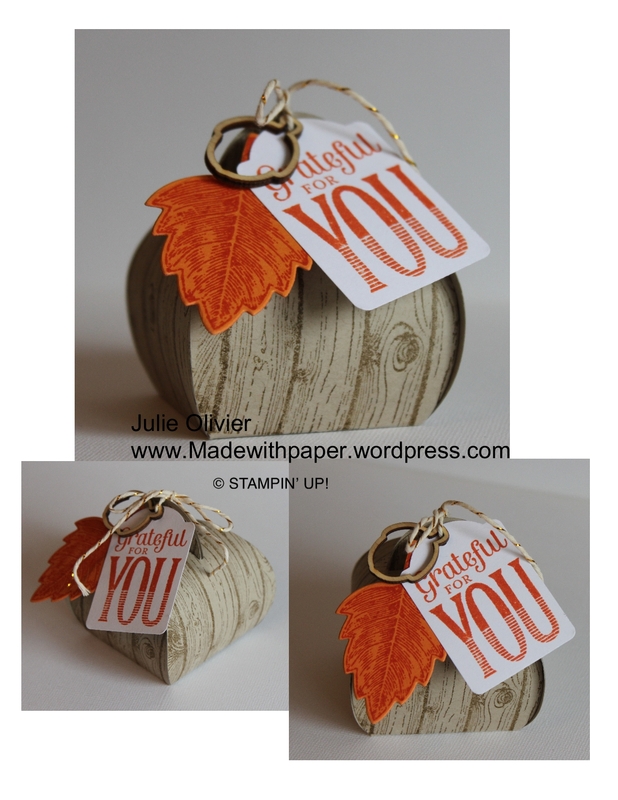 Here’s my little Thanksgiving Curvy Box treat and Thank you card! This is 2 of the projects we made at my Stamping club in September. We used the beautiful Vintage Leaves stamp set and matching Leaflets Framelits. I love creating Fall leaves with beautiful colors, using my ink pads and sponge daubers! Each one is unique! For the Maple leaf, I started with a Daffodil Delight card stock leaf, stamped with Early Espresso and added Old Olive, Pumpkin Pie, Soft Suede and Cherry Cobbler. 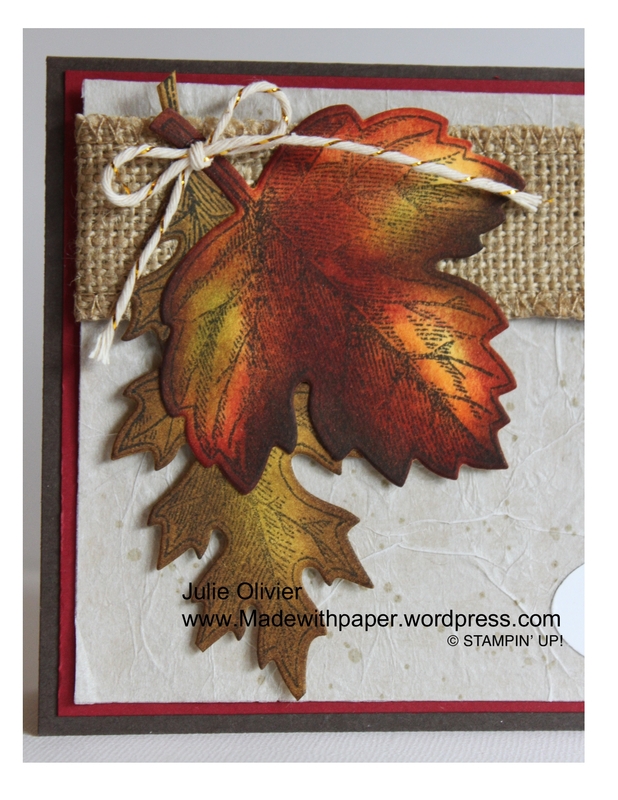 The oak leaf was also a Daffodil Delight card stock, sponged with Old Olive and Soft Suede. The background is a special technique, made with tissue paper applied on top of a Crumb Cake card stock. Gently wrinkle your tissue paper. Cover your Crumb Cake cardstock with glue stick. Add the tissue paper on top leaving some wrinkles in the process. Trim the tissue paper around the edges. 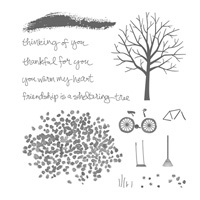 Stamp some ink splatters with the Gorgeous Grunge stamp set. This is a very simple technique, but it has a unique “handmade” paper look! 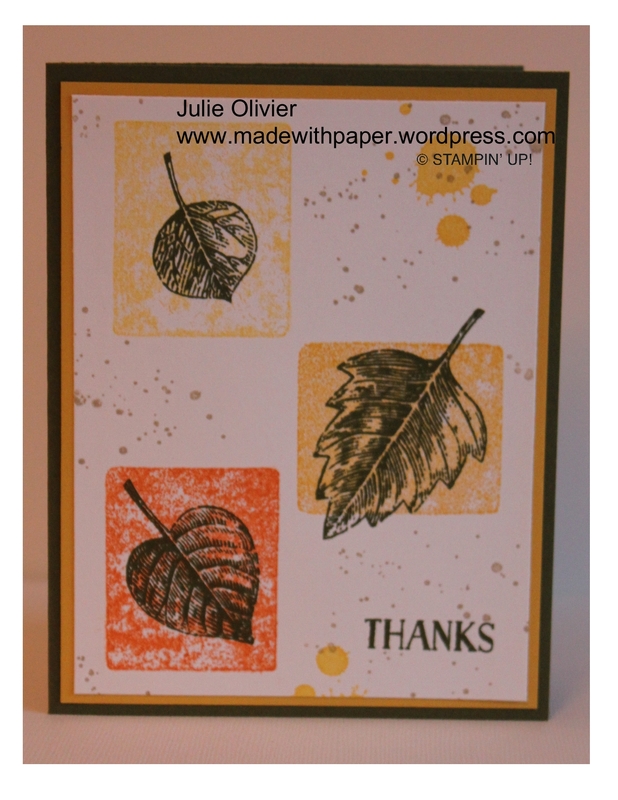 Vintage Leaves card: using clear blocks stamping! Summer is still here with this warm weather but we know that Fall is just around the corner! So here’s a “Fall” card for you today! I used the new Vintage Leaves stamp set. This set also has matching Leaflets Framelits. For the background, I used my clear block “B” to stamp 3 rectangles. I “inked” directly the block on the ink pad and used it to stamp my rectangles with Daffodil Delight, Crushed Curry and Pumpkin Pie ink. The leaves were stamped with Mossy Meadow ink. I also added some ink splatters from my favorite “go to” stamp set: Gorgeous Grunge! The stamp set “Traveler” is one of my favorite masculine stamp set. 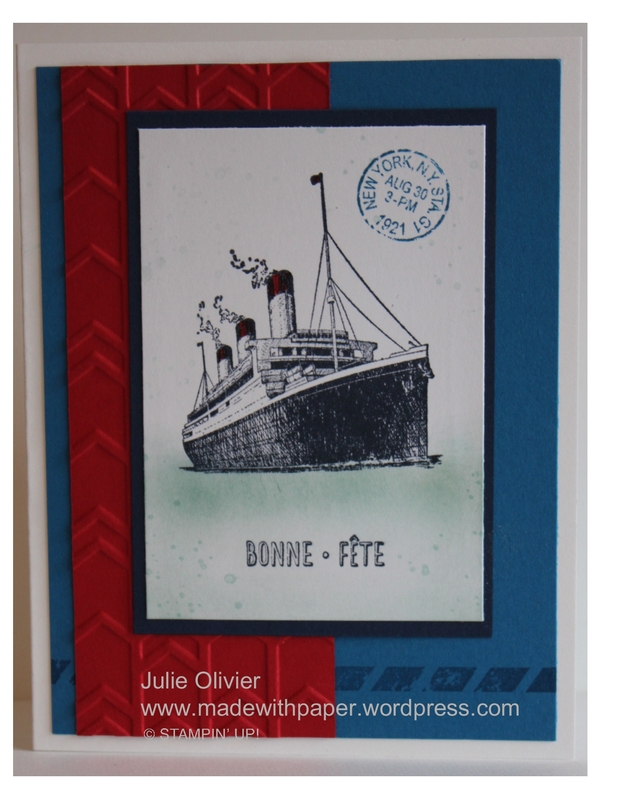 This is another card that I made with it, using the beautiful boat stamp. I used bright colors “Real Red”, “Pacific Point” and “Night of Navy” as my color scheme. I also used 2 stamps from “Butterfly Basics“, the “New York” circle stamp and the broken line at the bottom. This set has so many pieces and is really versatile! There’s also some ink splatters around the boat to imitate some water splashing, from my favorite “Gorgeous Grunge” stamp set. 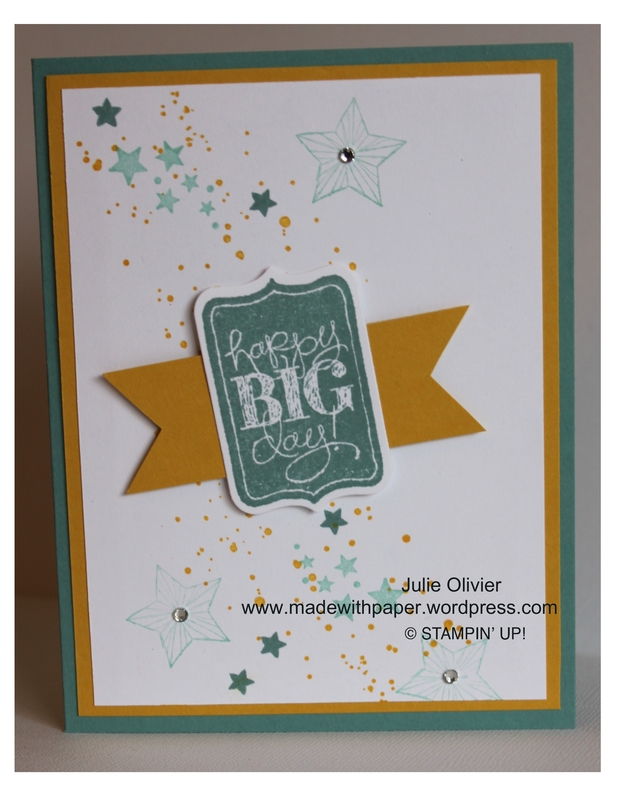 In the background, I used the Arrows embossing folder to complete my card. Here’s a sneak peek of one card that we will be making. Hope to see you there! Ink: Lost Lagoon, Crumb Cake. Today’s card was done with another set that is retiring at the end of the month: “Chalk Talk“. (Make sure to order it before May 26 if you like it! After that, it will be too late!!!) Chalk Talk is a stamp set that matches the Chalk Talk Framelits dies. I also used two other stamp sets, “Gorgeous Grunge” (for the ink splatters) and “Be the Star” for the star images. I would like to share with you the card I made for my husband for Valentine’s Day. I used a new set called “Sheltering tree”. This set is so beautiful! It is available in French and English. What is nice about this set is that it can be used for any season! The sayings are also beautiful… It’s not a traditional “Valentine’s Day” set, so you can get a lot more use of this set, all year long! 1. Cut half a sheet of Smoky Slate card stock. Fold in half to make the card base. 2. 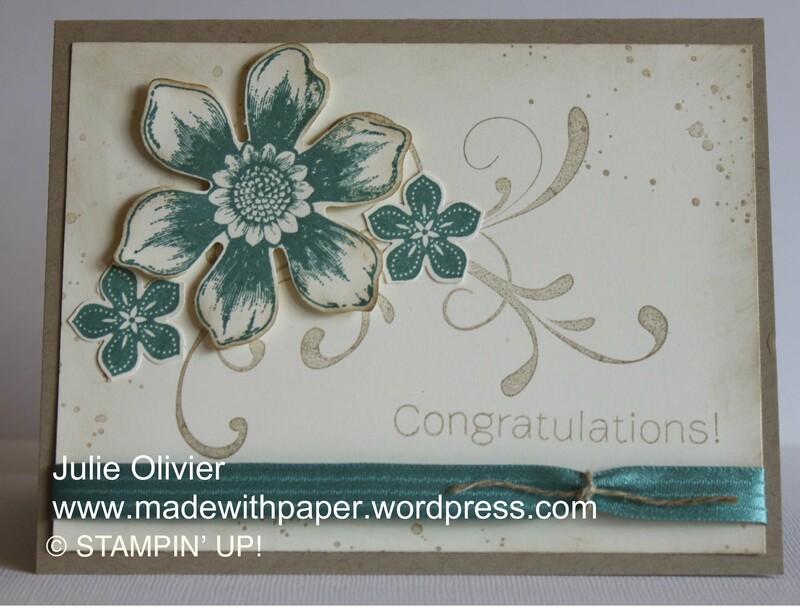 Stamp the card base with Smoky Slate “ink splatters” using the stamp from Gorgeous Grunge. Stamp the greeting at the bottom. 3. 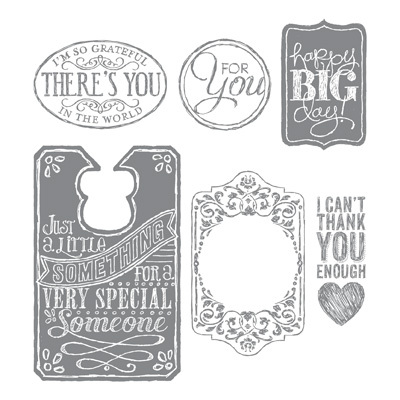 Cut a 3-3/4″ x 4-1/4″ Whisper White card stock. Stamp the tree with Basic Gray ink. Stamp the leaves with Blushing Bride ink. Stamp a few little leaves in Strawberry Slush on top. Stamp the ground with Smoky Slate ink and the Greeting with Basic Gray ink. 4. Cut 2 little hearts in Blushing Bride and Strawberry Slush card stock. Adhere on top of the tree. 5. Cut a 4″ x 4-1/2″ Blushing Bride card stock. Adhere on the card front at an angle. Adhere your stamped image on top.